An outdoor enthusiast for all seasons with a keen eye for killer design. A Cleveland native and recent Reno transplant, Matthew Forsythe joined the KPS3 crew in 2017 as a digital project manager. When he’s not exploring his new home in the Sierras, you can find him in our offices—ensuring clients’ digital projects are seamless, strategic and always successful. 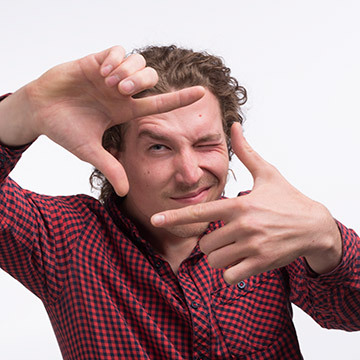 Matthew sharpened his skills at Ohio University, where he earned his Bachelor of Business Administration in 2012 and his Masters of Arts in Interactive Visual Communication in 2014. Upon graduation, Matthew worked as a freelance designer and videographer—producing killer content and perfecting pixels for clients ranging from yoga studios to taxi cab companies. In 2015, Matthew accepted a position as the website and marketing manager for the Scripps College of Communication at Ohio University, where he increased alumni interaction by 22 percent and boosted e-newsletter membership by 28 percent in just over three months. In 2016, Matt took his skills to the classroom as a design instructor at Ohio University, where he opened students’ eyes to the world of print and digital design (and received some pretty impressive reviews at the end of the semester). With both a seasoned eye for aesthetics and a wicked-sharp marketing mind, Matthew’s experience includes everything from website design to social media strategy to SEO and analytics. An Eagle Scout and avid lover of all things outdoors, Matthew enjoys running, backpacking, backcountry skiing, and floating in his big blue canoe.